Entitlement and Crime: is there a link? In our long hot dry summers of Australia, we seem to be seeing an increasing number of destructive and terrifying bushfires, with many deliberately lit. 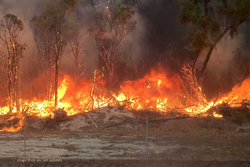 Recent research tells us that there has been an increase of nearly 40% in the number of bushfires in Australia, increasing from around 3200 in 2007 to nearly 5000 in 2013. And it has been estimated that about 13% of these are deliberately set, with 37% more being ‘suspicious’, with costs to our economy of about $1.6 billion a year. Psychologists now refer to deliberately lit fires as the act of Firesetting, which includes Pyromania and Arson. Pyromania is an impulse-control psychological disorder in which the individual gets intense pleasure or gratification from the fire. Arson is the criminal act of setting a fire usually for a specific purpose such as to obtain insurance money. Those involved in the prevention of deliberately lit fires are keenly aware of the necessity to prevent this destructiveness to save lives and property. A review of international research has found that around 30% of Firesetters will commit further acts of Firesetting. Although rare, some Firesetters have been found to be volunteer or paid fire officers. James Ogloff, one of the foremost Firesetting researchers in Australia believes that we must develop improved systems to screen prospective fire fighters. But, as I said, this is rare, and it's my belief that we must be thankful to our fire officers for their dedication, bravery and commitment to us and our community. However it is also clear that despite the potential danger, the vast majority of Firesetters do not wish to cause physical harm to others. There are many reasons or influencing factors to Firesetting, and many different types of Firesetters. It is essential that Psychologists and law-makers learn more about the reasons why Firesetters deliberately light fires. While we may wish to have a Firesetting criminal profile, despite the belief created from a popular television program, there is no specific mindset or personality of a typical Firesetter. It is clear from research that Firesetting is a complex behaviour with a range of factors influencing the setting of fires. Understanding the social context and emotional responses of the Firesetter, as well as the reasons and motives behind firesetting behaviour will allow us to develop greater knowledge on how to intervene and what treatment to provide, to help prevent further deliberately lit fires. One of the key functions at inSync for life, is to provide thorough clinical interviews and detailed reports of individuals who have committed an offence or who have been alleged to have committed an offence. These comprehensive reports inform legal representatives and the Courts, as to the primary factors influencing the offending behaviour, with the overall goal to assist in the prevention of further offending. Psychopathy and Sociopathy - the saga continues and becomes even more complicated! In a ﻿previous newsletter﻿ I talked about the ongoing confusion around the differences between a psychopath and a sociopath. Often, even mental health professionals use these terms interchangeably – as though they are talking about the same thing. However, to add to the confusion, many people also believe that Psychopathy is the same thing as Antisocial Personality Disorder, one of the most common psychological issues found in the residents of our prisons! So let’s have a look at Antisocial Personality Disorder or ASPD and how how we get to this point of confusion…after all, we as mental health professionals should be adequately trained to know our ‘paths’ when we encounter one. In the field of Psychology, we appear to have a clear definition and consistent measures of what ‘antisocial’ behavior is. The problem may have simply arisen because most people with psychopathy and sociopathy will fit the criteria for and often have a diagnoses of, ASPD. Antisocial personality disorder is a condition in which a person's ways of thinking, perceiving situations and relating to others are dysfunctional — and destructive with little regard to others or to society. It might seem clearer now that we can see that the symptoms of ASPD seem to mirror those of psychopathy and sociopathy. One of the key differences however, is that to have a diagnosis of ASPD, a person must have been diagnosed with a condition known as Conduct Disorder prior to turning eighteen years old. A clinician must have evidence of a clear and obvious historical pattern of destructive behaviours and ongoing disregard for others. These are what we refer to as ‘successful’ or ‘functional’ psychopaths and they live amongst us in all shapes and sizes. Clinicians continue to debate and argue how we can measure or quantify such a construct if we never truly know the historical and clinical history of such individuals. Is it ethical or fair to label people with diagnoses that would essentially label them as pariahs of society when we don’t have extensive, clear consistent evidence of what it means to be any of the paths? While ASPD is a formal diagnosis found in the manual of psychological and psychiatric disorders (The Diagnostic and Statistical Manual of Mental Disorders, 5th Edition – DSM-5), psychopathy and sociopathy remain as what are referred to as ‘constructs’. Psychological ‘constructs’ are considered to be hypothetical variables that cannot be observed. In 2013, a proposal to introduce a diagnosis of ‘psychopathic personality disorder’ into the DSM-5 was rejected and so we remain almost stuck with knowledge of our ‘paths’ but only one way to diagnose them. I’ll cover this issue in the next newsletter. Watch out for this in the near future.